Tom Croft is a classically trained portrait painter based in Oxford. He has produced paintings for a wide range of clients, from Manchester United Football Club to Oxford colleges and family portraiture. 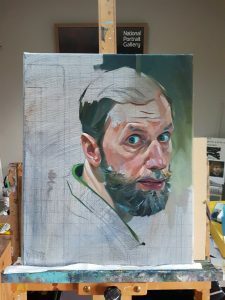 His notable portraits include the first female Bishop Libby Lane, author Mark Haddon, former Home Secretary Jacqui Smith, BBC Arts editor Will Gompertz, Radiohead bass player Colin Greenwood, performing artist and humanitarian Octopizzo from Kibera, Ride drummer Loz Colbert, footballers Wayne Rooney, David Beckham and Ryan Giggs. Tom appears on Sky Arts Portrait Artist of The Year 2018. Tom is a member of the Oxford Art Society and opens his studio to the public during Oxfordshire Artweeks.